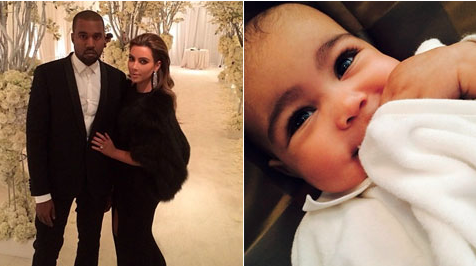 Kim Kardashian not letting wedding weekend affect bonding time with North West. Kim Kardashian may be busy preparing for her wedding to Kanye West, but the bride-to-be is still a doting mom. Joined by sister Kourtney Kardashian, Kim took baby daughter North West to the Givenchy store in Paris on Tuesday afternoon following a family lunch. "Kim was so attentive with North, who was looking around at the clothes and clearly a mini-fashionista already," an onlooker tells E! News. Kourtney's two children, Mason and Penelope, were not with them. Meanwhile, Kendall and Kylie Jenner, who landed in Paris this morning, returned to the Four Seasons George V hotel for the afternoon. She's supposed to be attentive to her child. No gold stars for doing what you're supposed to do!